Josh Brown|Miami Valley Today Troy’s Nathan Kleptz hits a backhand during a match at first singles Wednesday against Lehman. Josh Brown|Miami Valley Today Lehman’s Danny Lins follows through on a backhand at first singles Wednesday against Troy. Josh Brown|Miami Valley Today Troy’s Jackson Goodall hits a backhand at second singles Wednesday against Lehman. Josh Brown|Miami Valley Today Lehman’s Sam Gilardi serves at second singles Wednesday against Troy. Josh Brown|Miami Valley Today Lehman’s Max Schmiesing serves at third singles Wednesday against Troy. Josh Brown|Miami Valley Today Troy’s Genki Masunaga follows through on a backhand at third singles Wednesday against Lehman. TROY — With its entire lineup finally set in stone, the Troy tennis team has spent this week settling into a routine at last. Lehman, meanwhile, knew it would see two of its toughest matches of the season over the past two days. The two met on Wednesday at Troy High School, with the Trojans putting away their fifth straight victory by defeating the Cavaliers 5-0 in non-league play. For Troy (5-1), it was the third match since the final playoff between Nathan Kleptz and Jackson Goodall for first and second singles. The two had split two close trial matches before, but this time Kleptz was able to win both sets — both in close tiebreaker — to claim first singles. “We’ve got our lineup set now,” Troy coach Mark Goldner said. “That had to get taken care of, and we’re finally starting to settle in and play a little better at all positions. For Lehman (3-3), it was the second straight day of taking on some of the stiffest competition it will see all season. Tuesday, the Cavs took on Milton-Union, which boasts two returning state qualifiers from Division II last season. And while Troy lost five seniors to graduation in the offseason, Lehman’s losses were just as tough. “We lost all three singles and half of first doubles,” Ungericht said. “Considering what we lost, to be 3-3 — with all three of our losses to really good schools — Wapakoneta is good, and we lost to them 3-2 — to come that close and be 3-3, it’s really good. On Tuesday against Stebbins, Troy won 5-0 for its fourth straight win. At first singles, Kleptz defeated Joe Song 6-1, 6-0. At second singles, Goodall defeated Hawk Parker 6-0, 6-0. At third singles, Genki Masunaga defeated Matt Knospe 6-2, 6-0. At first doubles, Sean Dippold and Noah George defeated Ezra Haponek and Ant Quach 6-2, 6-1. At second doubles, Henry Johnston and Spencer Short defeated Ray Zheng and Aiden Meckumey 6-0, 6-0. Lehman, meanwhile, fell to Milton-Union (2-1) on Tuesday 4-1. At first singles, Milton-Union’s Nathan Brumbaugh defeated Danny Lins 6-0, 6-0. At second singles, Nick Brumbaugh defeated Sam Gilardi 6-2, 6-0. At third singles, Peyton Brown defeated Max Schmiesing 6-0, 6-1. At first doubles, Jake Swafford and Nathan Black defeated Elias Bezy and Elijah Jock 6-3, 6-1. Then on Wednesday, the Trojans won their third straight match in as many days since settling the battle for first and second singles. At first singles, Kleptz defeated Lins 6-0, 6-0. At second singles, Goodall defeated Gilardi 6-1, 6-1. At third singles, Masunaga defeated Schmiesing 6-1, 6-1. “Our singles players, I’m starting to see them move the ball around a lot and go for the easy shots, which is something they all three need to learn to do,” Goldner said. At first doubles, Dippold and George defeated Bezy and Jock 6-2, 6-0. At second doubles, Johnston and Short defeated Toner and Kramer 6-1, 6-3. After facing Trotwood Thursday, Troy will play in a four-team tournament at noon Saturday at Schroeder Tennis Center, taking on division rival Sidney as well as Bellbrook and Lima Shawnee. Lehman, meanwhile, hosts Piqua Thursday. 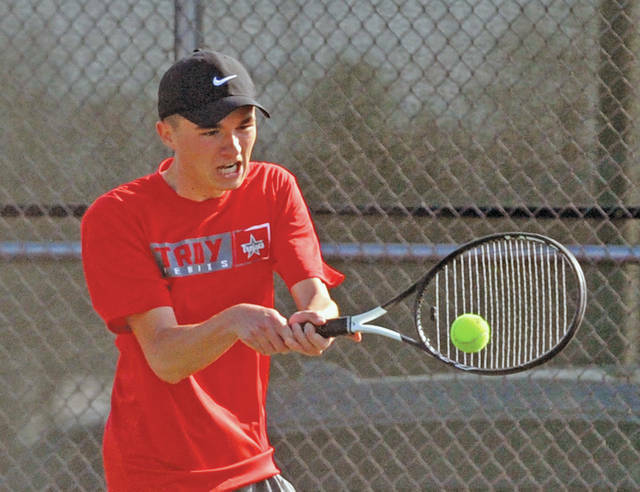 https://www.tdn-net.com/wp-content/uploads/sites/21/2019/04/web1_040319jb_troy_kleptz.jpgJosh Brown|Miami Valley Today Troy’s Nathan Kleptz hits a backhand during a match at first singles Wednesday against Lehman. 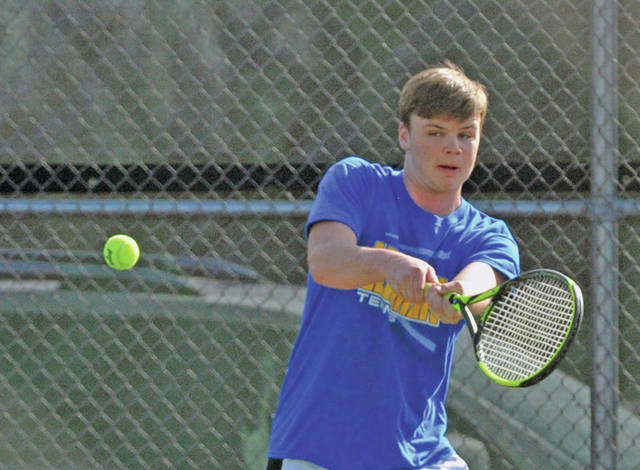 https://www.tdn-net.com/wp-content/uploads/sites/21/2019/04/web1_040319jb_leh_lins.jpgJosh Brown|Miami Valley Today Lehman’s Danny Lins follows through on a backhand at first singles Wednesday against Troy. https://www.tdn-net.com/wp-content/uploads/sites/21/2019/04/web1_040319jb_troy_goodall.jpgJosh Brown|Miami Valley Today Troy’s Jackson Goodall hits a backhand at second singles Wednesday against Lehman. 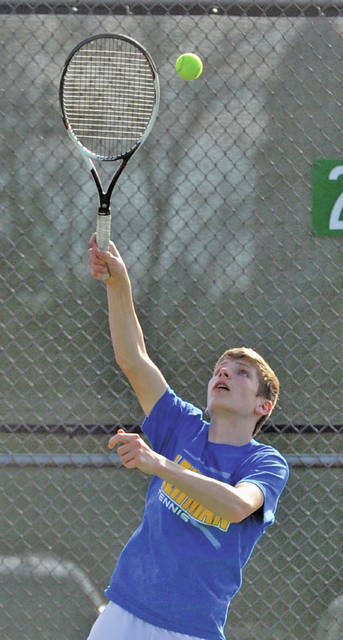 https://www.tdn-net.com/wp-content/uploads/sites/21/2019/04/web1_040319jb_leh_gilardi.jpgJosh Brown|Miami Valley Today Lehman’s Sam Gilardi serves at second singles Wednesday against Troy. 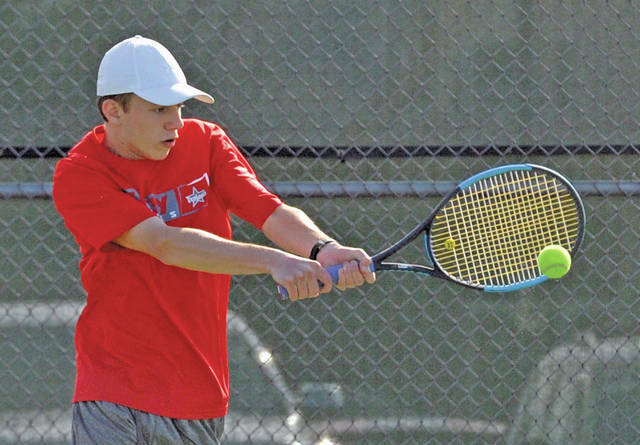 https://www.tdn-net.com/wp-content/uploads/sites/21/2019/04/web1_040319jb_leh_schmiesing.jpgJosh Brown|Miami Valley Today Lehman’s Max Schmiesing serves at third singles Wednesday against Troy. 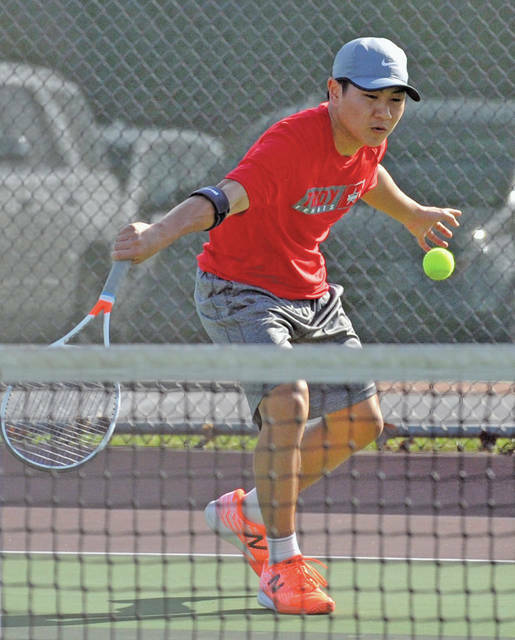 https://www.tdn-net.com/wp-content/uploads/sites/21/2019/04/web1_040319jb_troy_masunaga.jpgJosh Brown|Miami Valley Today Troy’s Genki Masunaga follows through on a backhand at third singles Wednesday against Lehman.